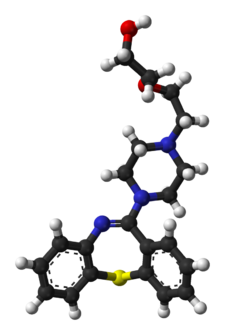 Quetiapine (better known as Seroquel) is an antipsychotic drug used to treat bipolar disorder and unipolar major depression, though it is used off-label for anxiety problems, Tourette syndrome and autism issues. The side effects of Quetiapine include fatigue, dry mouth and being sleepy. The medication is sometimes used for PTSD. ↑ Brunton, L; Chabner, B; Knollman, B (2010). Goodman and Gilman's The Pharmacological Basis of Therapeutics (12th ed.). McGraw Hill Professional. ISBN 978-0071624428. ↑ 2.0 2.1 "quetiapine (Rx) - Seroquel, Seroquel XR". Medscape Reference. WebMD. Archived from the original on 20 October 2013. Retrieved 11 October 2013. ↑ 3.0 3.1 3.2 "Quetiapine 25 mg film-coated tablets - Summary of Product Characteristics". electronic Medicines Compendium. Sandoz. January 2013. Archived from the original on 20 October 2013. Retrieved 20 October 2013. ↑ 4.0 4.1 Truven Health Analytics, Inc. DrugPoint System (Internet) [cited 2013 Sep 18]. Greenwood Village, CO: Thomsen Healthcare; 2013. ↑ "QUETIAPINE FUMARATE tablet QUETIAPINE FUMARATE (quetiapine fumarate ) tablet [Ascend Laboratories, LLC]". DailyMed. Ascend Laboratories, LLC. October 2013. Archived from the original on 2 December 2013. Retrieved 26 November 2013. This page was last changed on 5 March 2019, at 17:06.